I love reading blogs. There are so many good ones out there! I have some faithful readers of my blog who have their own blogs and do a great job with it. Blogs can be entertaining, they can record life, share thoughts, be informative, or be like a letter from a friend. There are several blogs that distill wisdom. Some of them only publish once a week due to the depth of their content. I enjoy reading them though and applying their lessons to my life. Try them out for yourself and see if they give you ideas for your own life. Today’s picture is a setup that my favorite boy toy was experimenting with a few years ago for some of his pictures. 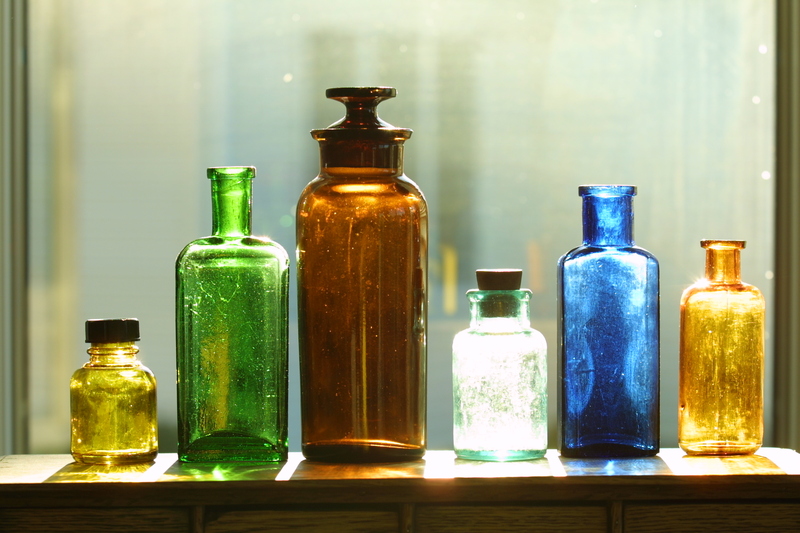 Undoubtedly at least a few of these bottles were used to distill spirits. Word for tomorrow – TREMBLE. If you prefer to work ahead, see the list for the week under “A Word A Day”. Another great picture – you’re posting some great stuff. This is what I love about multiple people doing it – everyone has a different idea from the same word.